STEPHEN GIRARD'S - "GIRARD COLLEGE"
​as it once was .... and will never be again! Founded in 1833 in Philadelphia, Pa.
all of ​its operations to be! world renowned for its education successes! Stephen Girard's - "Girard College" - impossible to be replicated again! "Mighty Master of the Future!" A boy's life to be changed forever! This website is a historic "Public Record" of Stephen Girard's - "Girard College"! Exactly as Girard envisioned it to exist and how he mandated it's operations to be! Under Stephen Girard's guidance for Girard College's strict education programs - both academic and vocational - - Girard College soon became world renowned as a highly successful educational Institution! Girard College was acclaimed throughout the world as being the "premier" education school of its kind! Its successful operations serving as the educational format for other great institutions to follow! This website was created to ensure that the greatness, successes, realities of the past operations and performance of Stephen Girard's - "Girard College" will not diminish nor be forgotten with the passing of time! This website serves as a pictorial revelation of the philanthropy, the generosity and the greatness of Stephen Girard! This website is a true reflection of the way Stephen Girard's "Girard College" operated under the strict guide lines that Girard demanded for his school to follow! Stephen Girard's "Girard College" - its proven performance of educational excellence and personal character building of its students must be remembered and not be hidden away in history books. Unfortunately Stephen Girard and his "Girard College" - - has been minimized and even forgotten by today's general public! It is so unfortunate that the "Girard College" that Stephen Girard had envisioned, created and financed for over 130 years no longer exists! Stephen Girard deserves recognition and appreciation for what his school had accomplished over many years! There are other contributions Girard unselfishly gave to society! The creation of the "Girard College" that Stephen Girard had envisioned benefited thousands of orphaned, fatherless young boys! It was a highly successful endeavor on the part of Stephen Girard. His "Girard College" mandated operations were praised, recognized and acclaimed by people all over the world for its unique, highly successful academic and vocational training programs. Stephen Girard's "Girard College" set the highest education standards for similar great Institutions to follow! ​Not only did Stephen Girard's "Girard College" educate its students - it also sheltered them, it housed them, it fed them, it gave them clothing to wear and provided all of the medical attention that were needed to insure that all students lived healthy lives while growing up and being educated in his great school. Just imagine the expense of providing a quality education and the expensive caring for thousands of young orphaned boys for over a period of 130 plus years! ​One year alone - the school's enrollment exceeded 1800 students. The success stories of Stephen Girard's "Girard College" can go on and on! Stephen Girard educated thousands of orphaned boys to become self-reliant, independent and free thinkers! Many of them, following Stephen Girard's lead, would contribute to the betterment of society. It is important that the general public remember all of this! We must not forget what Stephen Girard's "Girard College" once was - and we must not forget the generosity and wisdom of Stephen Girard for what he contributed to society and to the world. This realization would be a much better one than the uncertainties of the future of the present day Girard College as it is being operated today! This website is a photographic rendering of Stephen Girard's "Girard College" - where one photo can express a thousand words to the viewer! These revealing photos reflect the true realities and educational successes of Stephen Girard and his "Girard College"! These photos are visual proof that Stephen Girard's grand vision for the operation of his school did become a reality and its mandated operations were successful in every way! Exactly as Stephen Girard envisioned it and deemed his school to be! The webpage photos throughout the website depict disciplined and happy young lives growing up while being exceptionally educated! Students can be seen playing on the sprawling and beautiful campus of Girard College! Everyone of these students being highly educated within the structure and guidelines that Stephen Girard mandated in his Will for the operation of his school - "Girard College"! We students lived a sheltered life from the real world - intentionally protected from society so as not to be influenced with varied public policies nor the many faiths of the religion community - nor even the life styles of people living outside the protective walls that surrounded the Girard College campus, Stephen Girard did not want the rhetoric and going ons of the outside world to dilute, influence or interfere with the developing minds of innocent young boys! We were educated by a committed team of dedicated professionals! Teachers, headmasters, housemothers, mentors and administrators - all guiding us into manhood so that we would become the man that Stephen Girard had envisioned for his school to produce, We were being forged, day by day, by these individuals to become responsible and constructive citizens who will be able to contribute to the enormous task of making a better world for all to live in. Since the opening of Girard's school in 1848 -- Stephen Girard's generosity and grand vision for his school resulted in the educating and sheltering of over 24,000 orphaned boys. We were given an academic education coupled with vocational training! Two separate and different types of educations to insure all students would be able to survive living in the real world! We were to become self-reliant, independent, intelligent and confident individuals! We would be well prepared to meet and overcome any worldly obstacles that may confront us when it was time for us to live in the real world! Many of Girard's graduates became noted men of education, integrity, wealth and accomplishments, The school's production of responsible, free thinking, independant young men into society was one of Stephen Girard's greatest gift to the world! There were many other gifts Stephen Girard unselfishly gave! All one has to do is access the Internet to see his many contributions and his civic accomplishments that benefited thousands throughout his lifetime. Today it is very difficult for the older graduates of Stephen Girard's "Girard College" to accept what has transpired over the past years to the school we grew up in! It's operations has been drastically changed! Many of our school's traditions have been abandoned by the new administrators of Girard College. The Mechanical School that provided vocational training has been shut down. The Girard College Battalion was disbanded and is no longer a contributor to a disciplined Girard life. The Girard Camp, located in the Pocono Mountains, was sold off denying future students of this popular summer adventure, Some of our proud traditions of "school spirit" that we older graduates celebrated and held onto to for over a hundred twenty-five plus years - no longer exist! Through all of these dire changes the members of the Girard College Alumni Association are well aware that today's Girard College is still providing a great education for disadvantaged children! The school is still preparing children in need to become well educated and independent free thinkers who will be able to contribute to the betterment of society. Producing responsible educated and independent adults was the original objective of Stephen Girard for the creation of his "Girard College"! 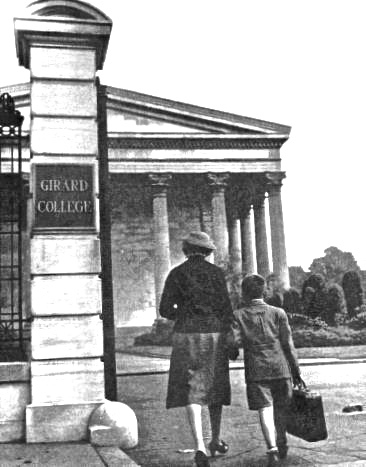 Girard College was to be an exceptional school to help children in need! This is exactly what the present Girard College is doing today! We, the older members of the Girard College Alumni Association are aware of this and we strongly support the school for continuing the grand legacy of Stephen Girard. The Girard College Alumni Association awards scholarships to graduating students that are in need of financial help every year! The Girard College Alumni also provide financial support for student field trips and contributes financial assistence for the operation of the school. ​We - the older Alumni members continue to support the new school in the caring and educating of disadvantaged children! We know that this is what Stephen Girard would expect of us to do - - and he knew we would! be my life. When I am dead my actions must speak for me!" Stephen Girard was born in the Atlantic merchant and naval seaport city of Bordeaux, in the Kingdom of France. Stephen Girard (1750-1831), was the eldest of nine children. His mother died when he was aged 11, and he left home at the age of 14 to spend the next 12 years sailing the seas and learning the international mercantile and shipping business. Girard arrived in the Delaware Bay and River port city of Philadelphia in June 1776, during the momentous summer of American Revolutionary War events at the nearby old "Pennsylvania State House" now "Independence Hall". Girard remained in Philadelphia for the rest of his life. During his 55 years in the "City of Brotherly Love", he became one of the richest Americans of his time. In 1777, at age 27 Girard married Mary Lum. They were married until her death in 1815. They had no children. Girard College's operational provisions were mandated in Stephen Girard's Will! Stephen Girard meticulously outlined the educational agenda under which his school was to operate. 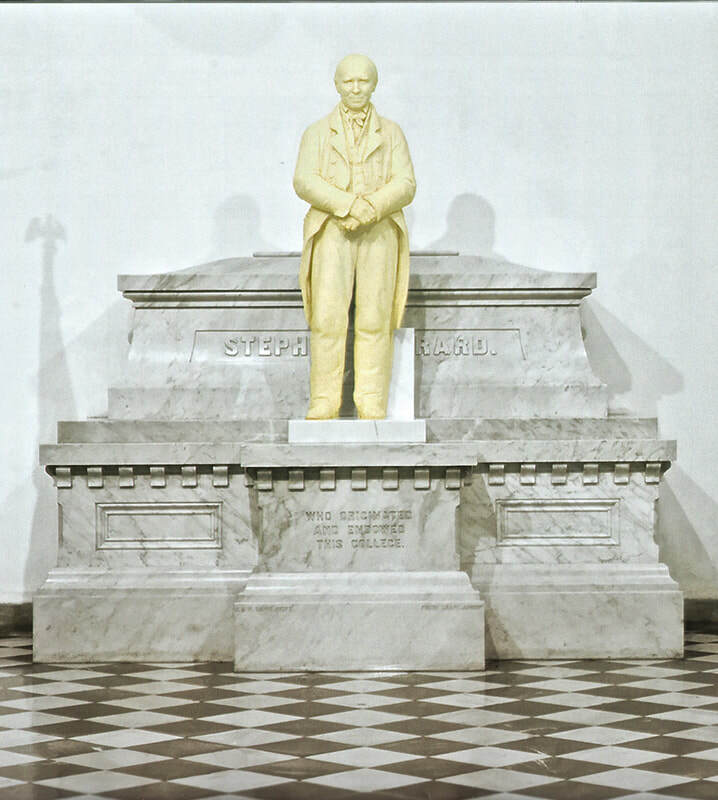 Girard 's grand vision for his school insured that the highest quality academic and vocational education will be offered to the students of Girard College! 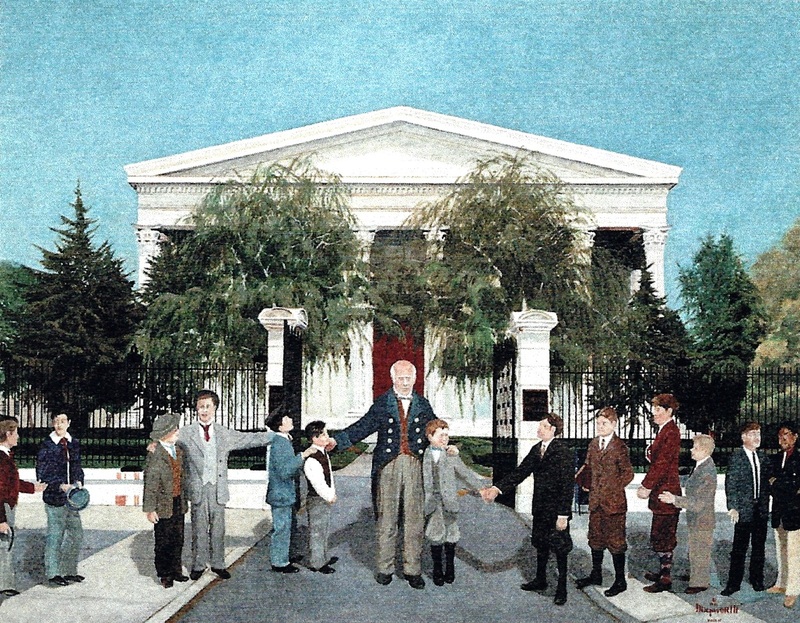 Girard's vision was for the creation of a school for poor, white, orphaned boys who had lost their fathers - - his concept was unique in educating an entirely unserved population. Girard saw a chance to educate boys who might otherwise be lost to the hopes of Society and to prepare them for useful, productive lives. Girard chose to dedicate his immense fortune to help educate young men of Philadelphia to become responsible Americans for the future. capped with thick marble stone slabs! 1 & 1/4 miles long! To interact with the wall - click on the link below!